Police have arrested a woman accused of killing her two-month-old baby by feeding him a deadly amount of salt in Dohar upazila of Dhaka.The newborn has been identified as Md Sayem. The child's father Mohammad Bachchu Miah, 30, filed a case against his wife Sathi Akter with Dohar Police Station on Monday night, said Sub-Inspector Md Hafizur Rahman. Sathi, 21, was arrested over the case and produced in court around 11:00am on Monday, he said. Bachchu, a day-laborer from Miapara neighborhood of Uttar Joypara in Dohar, married Sathi about three years ago. 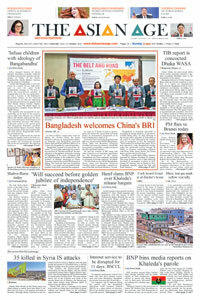 The couple has another child, Sabiha Akter, who is two years old, reports bdnews24.com. "Sathi told her husband to bring some milk for newborn Sayem on Sunday but Bachchu was too poor to afford that. Sathi tried to collect some money to buy some milk but the neighbors couldn't help her. Unable to buy some milk, Sathi was so depressed that she fed him salt." Sathi took Sayem to the Upazila Health Complex after the salt caused serious breathing problems to him. Doctors declared later him dead, SI Hafizur Rahman said. Police arrested Sathi on Monday and she confessed to killing her child in an initial interrogation, he said. "We are very poor. My wife asked me to buy milk for our son but I failed. She killed our son out of frustration," Bachchu said.